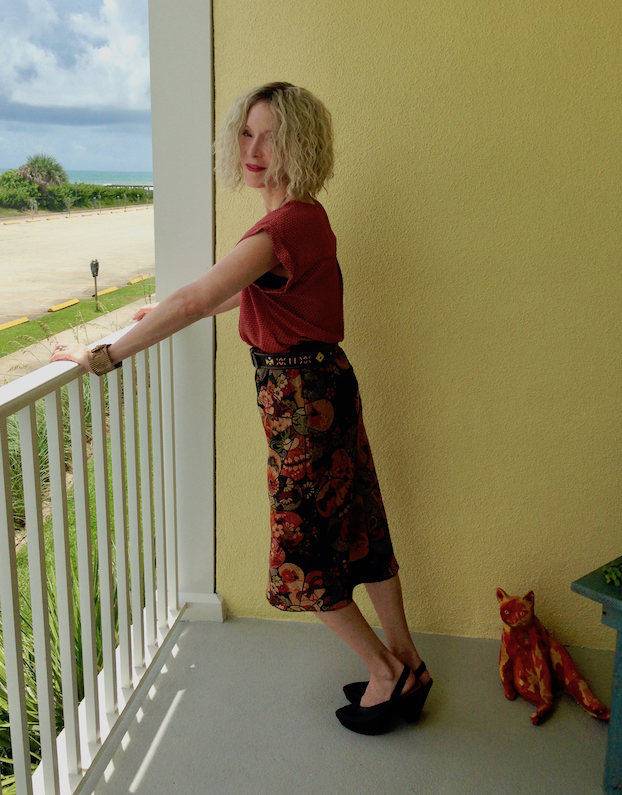 The only thing better than a great-fitting floral skirt is a vintage floral skirt, and one that cost less than two cups of coffee. I had a blast thrifting in Toronto with Suzanne and Ally, and came home with some treasures, including this fab 1970’s (?) print skirt. I’ve already worn this skirt several times, with a black long-sleeved tee, and with a peachy blouse (similar), as here. I love the skirt’s length and the slim but not-tight fit. I added a vintage bib necklace (sim), leather patterned belt (sim) and a cuff from Citizen Rosebud‘s shop. The black leather platform pumps (sim) are proving to be versatile. Beautiful skirt! You find the best bargains! What a scoop that skirt was Patti, it’s a gem. All of those wonderful colours to choose from – so much choice, so much fun. I could be a tad envious if I wasn’t so happy about my forthcoming shopping trip to all of my fave charity shops! Love your hair, your look and the fluttered sleeve blouse from Nordstrom. You look so pretty, Patti! You do find some great clothes thrifting! I love the skirt, the pattern and colors look so pretty on you. Those shoes look so fab, love the style ! Have a great week Patti! I love this Visible Monday link up idea. Thank you for organizing it. Your skirt is so pretty and chic. I like the whole look. What a beautiful skirt and so skilfully styled! You look gorgeous, Patti! I agree that this is the best find! Thanks for the party! Oh that skirt is fabulous! Great find, Patti. I used to own a very similar floral skirt like yours and regret giving it away!! This vintage skirt is truly beautiful. Thanks for the linkup! I’m in love with your vintage floral skirt! I LOVE how you’ve styled this! I think I like the peach is even better than the black top. Peach with your skin tone is so lovely. That is the cool thing when you buy a skirt with so many colours. You can match it with everything. This is one of my favourite outfits of yours. Am I jealous of your view? Uh, yeah. Your ensemble is the perfect manifestation of summer. Thanks for hosting Patti! I am swooning over the skirt, too! So fabulous! Oh, I am swooning over this beautiful skirt! SO gorgeous and perfect with your peachy blouse. That skirt was a great find for sure! Love that print. How fun that you found it thrifting with Suzanne. Reminds me I got to get working on having my passport renewed!!!! Oh wow that skirt is a super find! I love how you have styled it! I haven’t been to our thrift shop lately, you remind me it’s time to stop by! Peace! I could totally get used to that view! That s the kind of skirt I love! I just threw away a skirt like that. It was totally worn out. I love the huge daisy print on the front of your skirt. Like you, when I get a new fave piece of clothing I’ll wear it and wear it. And the price was soooo right too. I’m glad you and Suzanne and Ally had a chance to get together. Am I jealous? Oh noooo, who me? Hahaha. Thanks for the linkup! It’s a gorgeous skirt and so flattering on you … a lucky find indeed. Thanks for sharing and hosting. Looks like a perfect skirt on you, Patti! Love it when you show us the beach! Thanks for the link up and have a great week. You’re beautiful, Patti! Love the skirt and those cool shoes! That print is so unique, Patti!! How could you not have bought it?? What a fabulous skirt! And even better that you found it on your trip with Suzanne & Ally. Thanks for the linkup & have a great week! I really like your skirt. Only recently have I been on the look out for some type of floral-something-it’s not in my comfort zone for some reason but I sure would like to step out-but it has to be thrifted so that makes a bigger challenge,,,,,for some reason, I want big roses-don’t know why.